We adopted a new cat! Actually, we adopted him last Fall, but things have been a bit difficult around here so I wasn’t ready to post about our lack of success getting Lulu to warm up to this new arrival in the early months. Yes, this process has taken months and months. Is Lulu happy with her new “big” little brother? Although Hans and I had already agreed that we weren’t yet ready to adopt another cat, I had been looking at the Calling All Cats (CACR) Facebook page for months. It’s how I satisfied my kitty fix when Lulu was curled up with my husband! I became intrigued with this small team of foster volunteers who rescue and socialize many cats and kittens. 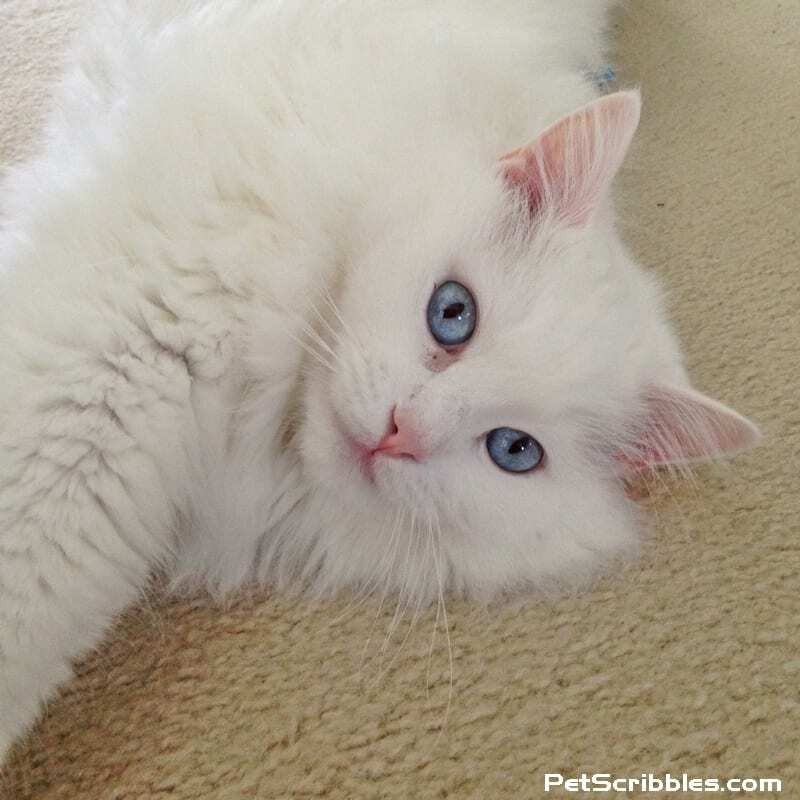 I’d check their page each morning and each night, and read about the newest cats they rescued. 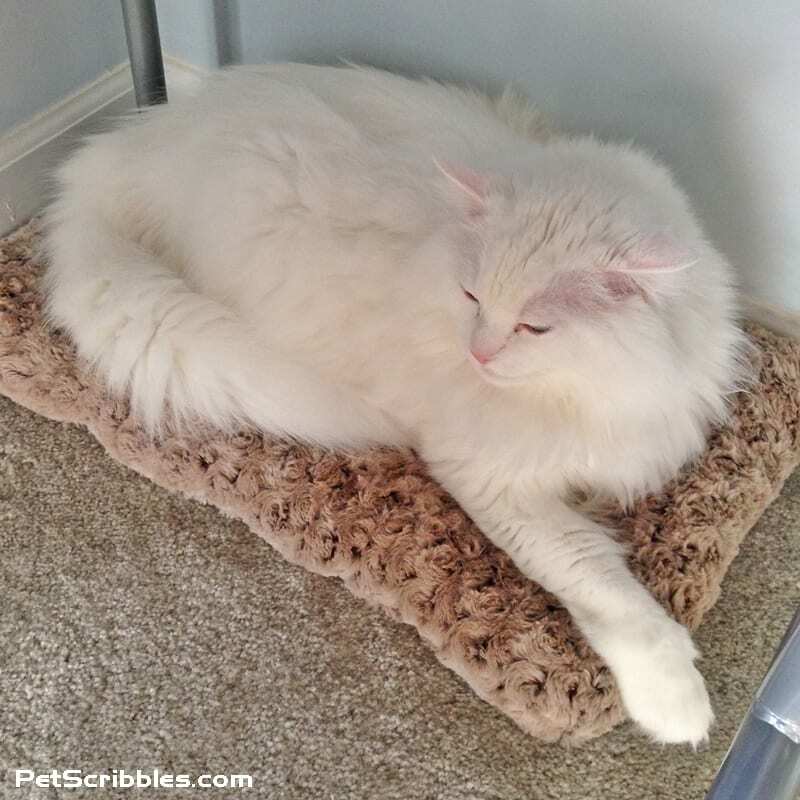 The work they do is amazing, and some of the cats they take in are in sad shape on arrival. Others are strays, homeless or find themselves in sad situations. 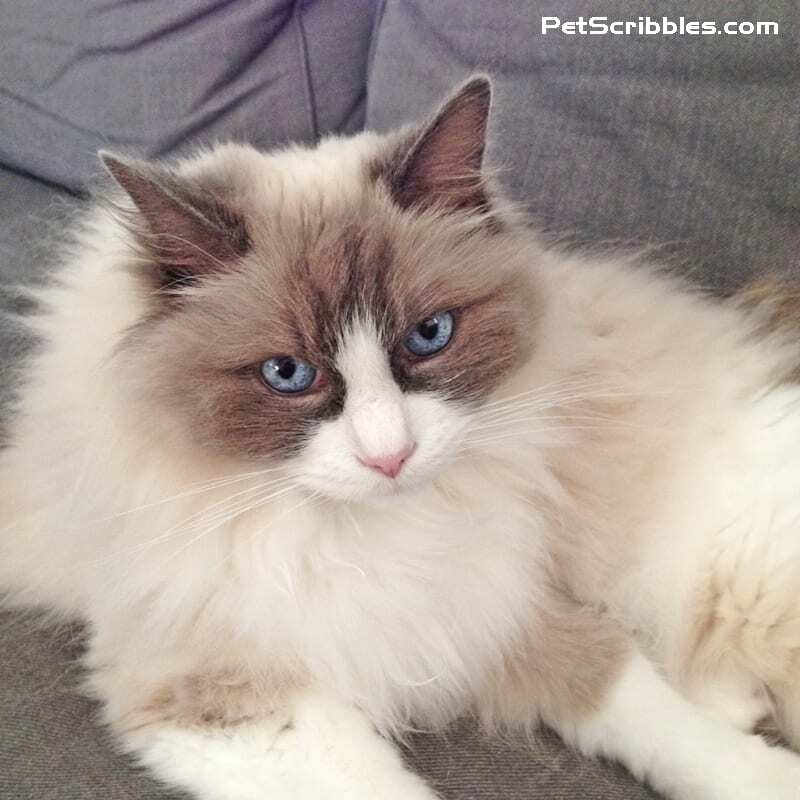 I showed the post to Hans, and I think he and I both knew this Ragdoll boy was possibly going to be ours. 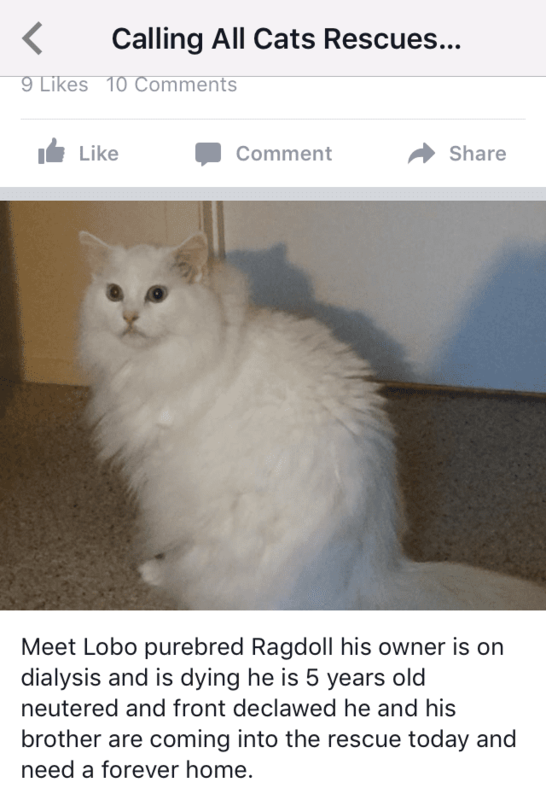 Lobo and his brother — a purebred Birman kitty — didn’t appear to be bonded at all according to the cat rescue. 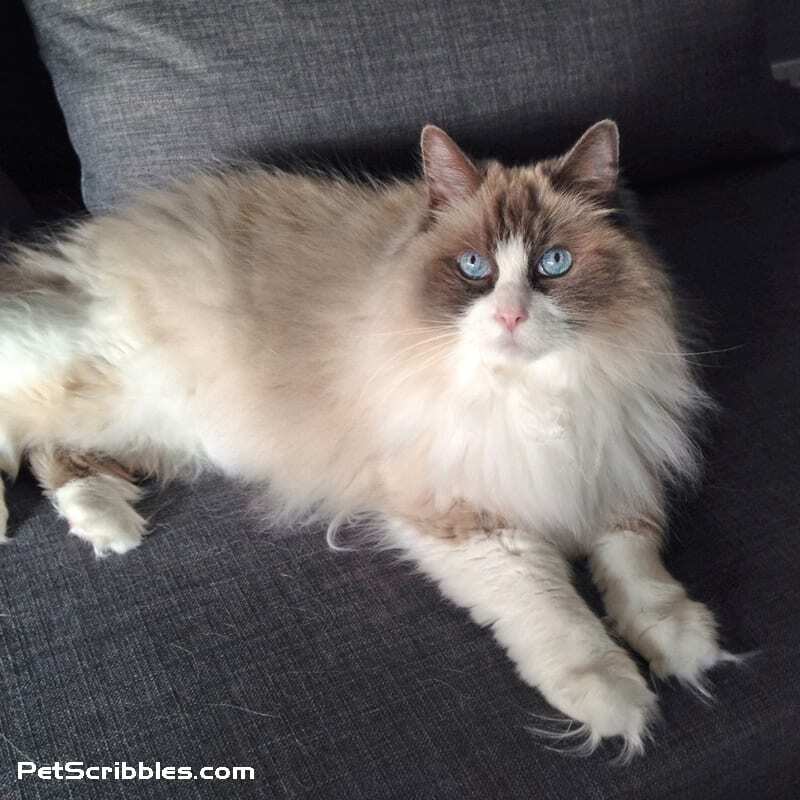 The Birman found a furrever home with a woman who already had a Birman, just like we already had a Ragdoll! These are the first images I received from Lobo’s foster mom . . .
Lobo was very matted, and also a bit scared and depressed. Although he was affectionate, his foster mom was unsure how playful he would be. Oh – and he didn’t have his claws. We had some concerns about Lobo not having any claws. Cats who are declawed can develop behavioral problems, health issues, and can be in a great deal of pain for the rest of their lives. (Cats hide pain well.) 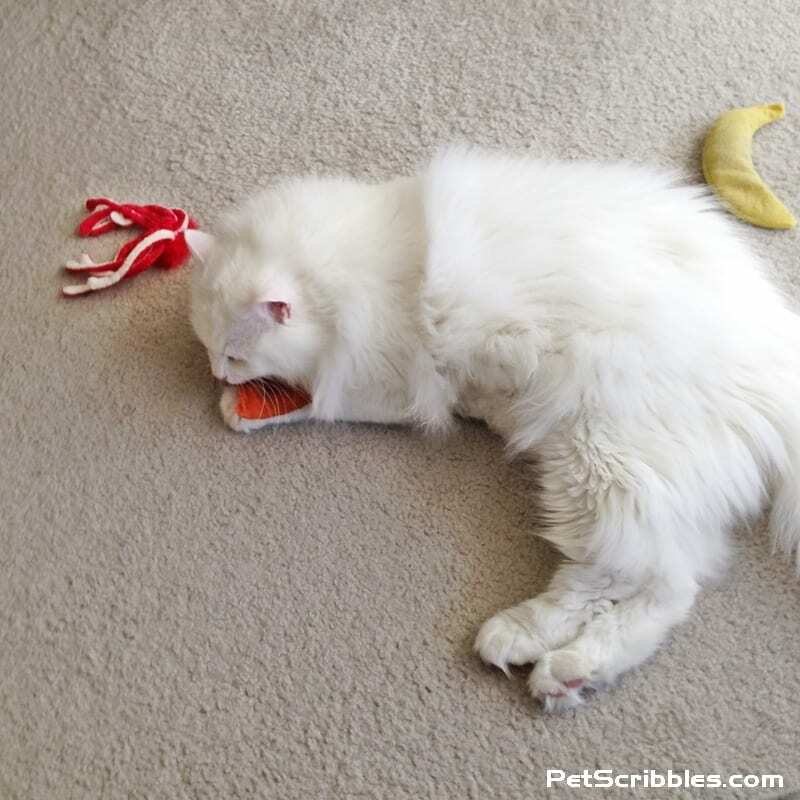 The early assessment was that Otto seemed to be OK without his claws. 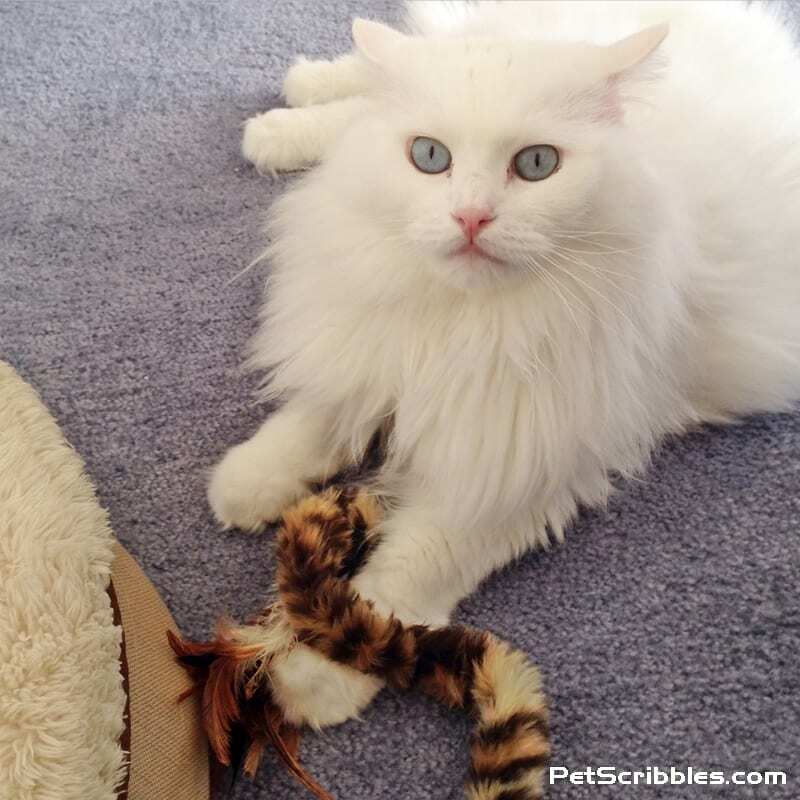 We would take our chances to give this boy a new furrever home. Calling All Cats took Lobo in for a complete vet checkup. 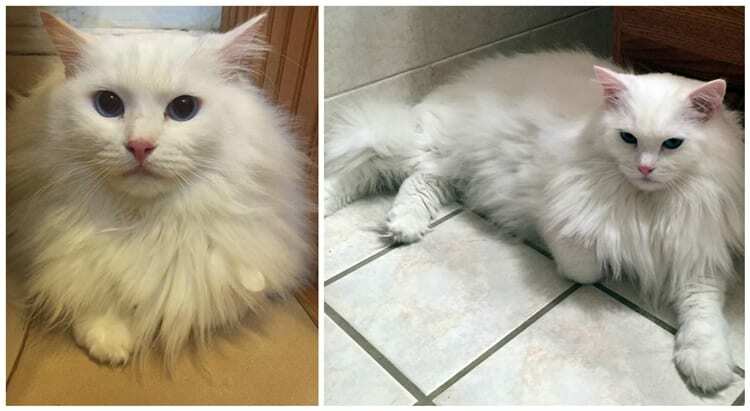 They also took him to the groomer for what amounted to a spa day: there were quite a lot of mats to be removed and they found his claws underneath the matted fur! We were very relieved and happy that he had his claws! Whoo-hoo! Lobo also wasn’t responding to his name at all, no matter what his foster mom tried. So we decided to give him a fresh start with a new name: Otto! What’s the very first thing Otto did when we brought him home? 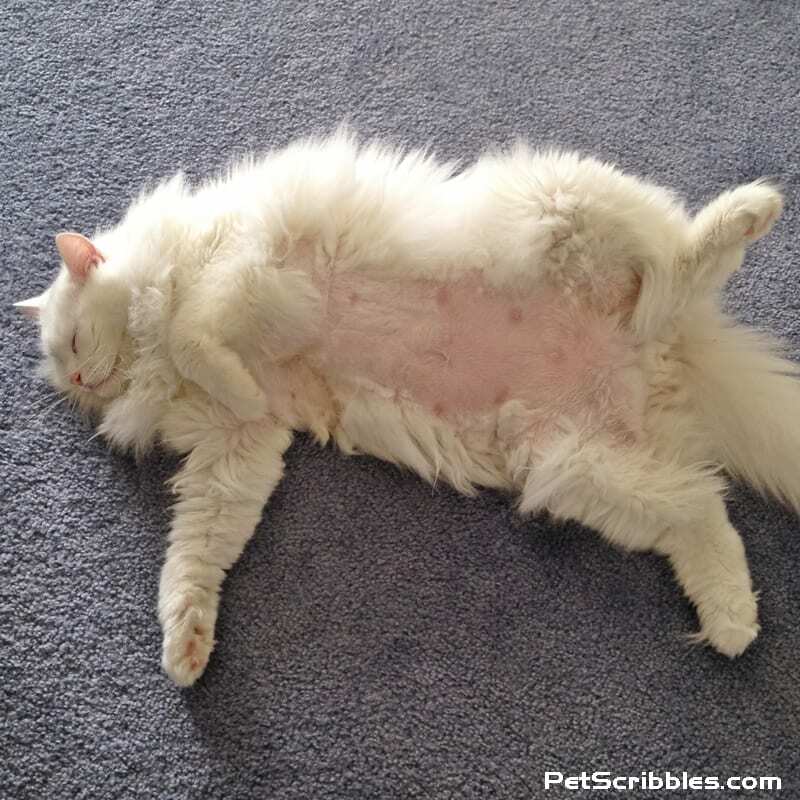 You can see how they had to really shave his belly fur to remove all of the mats he had. That first day, after he slept, he played with me a bit. The look on his face seemed tentative, unsure if he was going to be moving again or if this was his new home. We reassured him that he was now part of our family, his furrever home. I talked to him a lot. And he did a lot of thinking . . .
Lulu was very clear with us that she was not happy with this giant white thing. 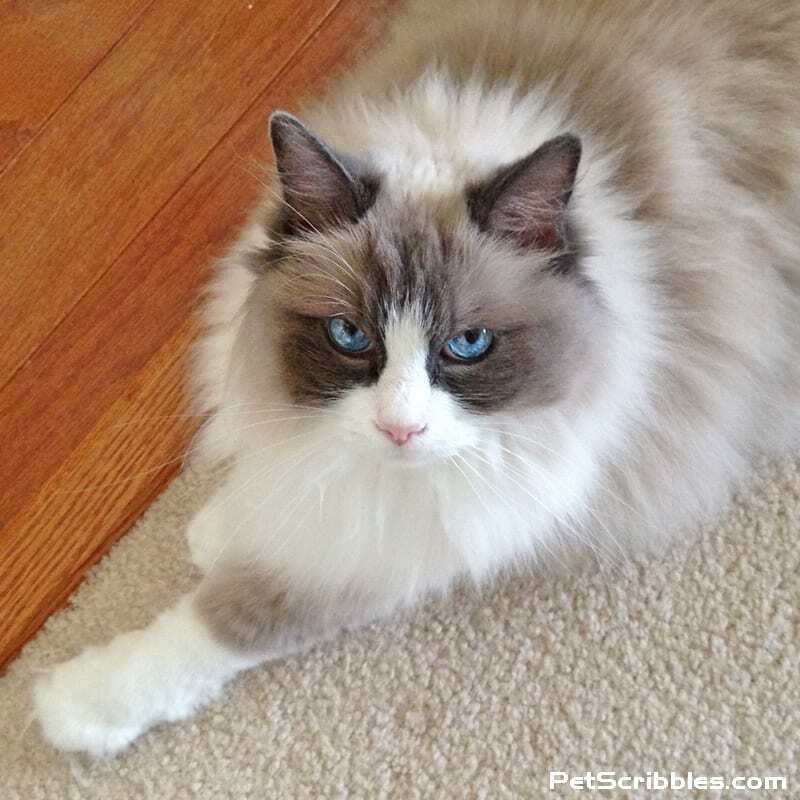 Lulu’s rationale was this: She’s barely 10 pounds of fluff. She’s petite. While Otto was almost 20 pounds of muscle and fur. Otto was huge. Conclusion? Otto was going to eat Lulu. We tried looking at it from Lulu’s perspective. Lulu is 15.5 years young. We say she’s still a kitten, but signs of age are showing. She’s lost some muscle mass, as senior cats do, so she feels more bony. Sometimes I worry that Lulu — who has always been our “rough and tumble” kitty — is becoming a bit more fragile. 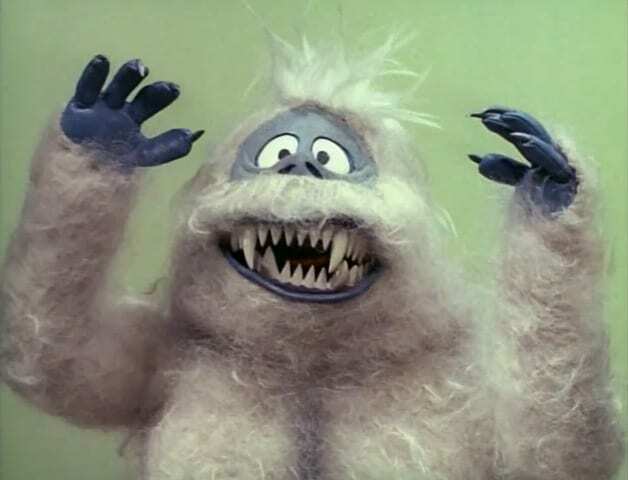 Imagine a wee little ragdoll having this giant blur of white fur coming towards her — like the giant Bumble from the Rudolph the Red-Nosed Reindeer cartoon — and he seems scary! Lulu hissed. Lulu spit. Lulu swatted. And that’s when we realized: Otto is almost totally deaf! 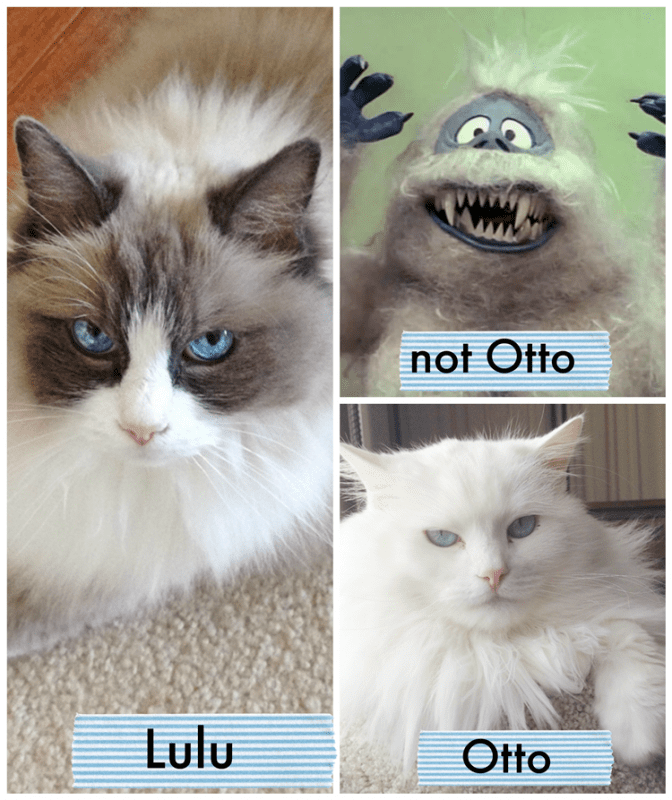 I wondered about that from the very beginning because Otto is completely white and has blue eyes, and many cats with both of those traits can be deaf. 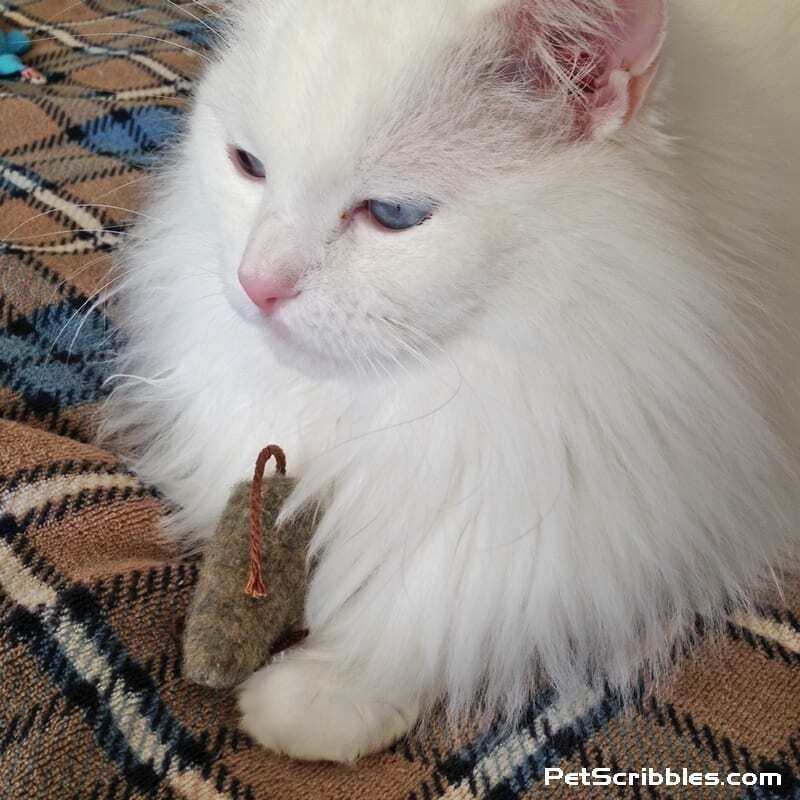 But it’s worked out in our favor – and Otto’s too: he doesn’t hear Lulu hiss at him! And so he carries on with his mission to win her over and become the best little brother he can be! 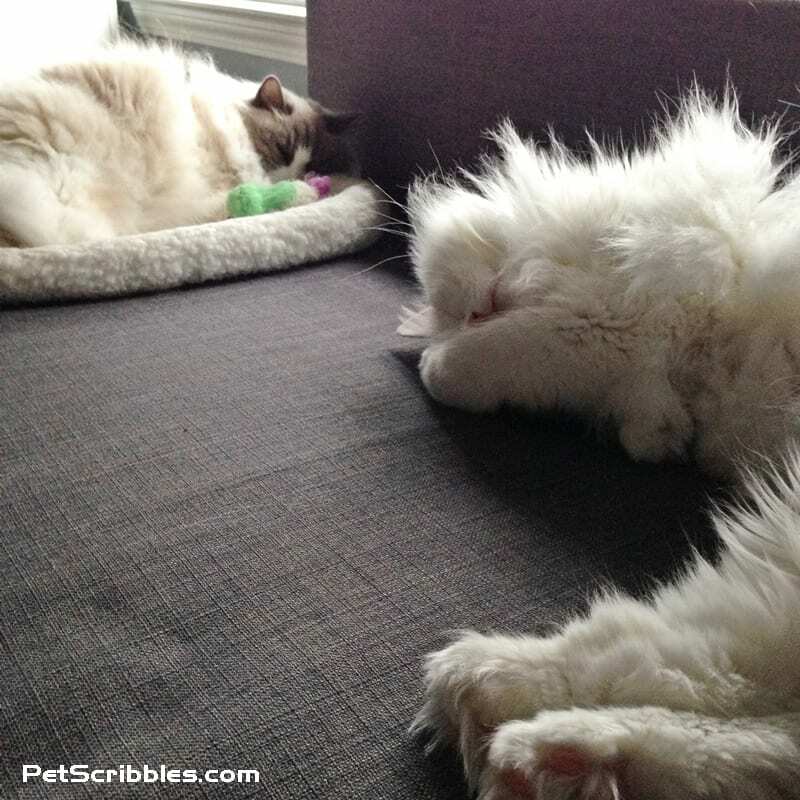 He hasn’t ever hissed back, swatted back or tried to jump or attack her. He’s just a giant mush of love and affection and playfulness! When Otto isn’t stuck to me like glue, he attempts to stick to Lulu like glue! Here’s Otto in December, snoozing near Lulu on “her” couch in my husband’s office. He quietly got closer and closer while she slept. And then he slept too! And this picture was taken in February. 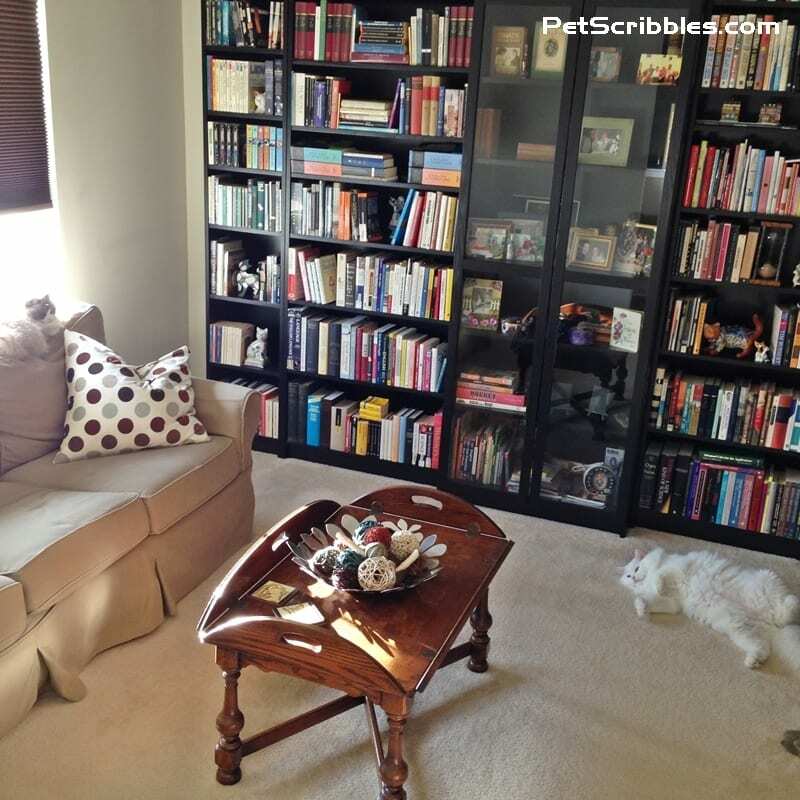 Lulu loves to sit on the back of the couch in our Library in the mornings and watch the world go by. 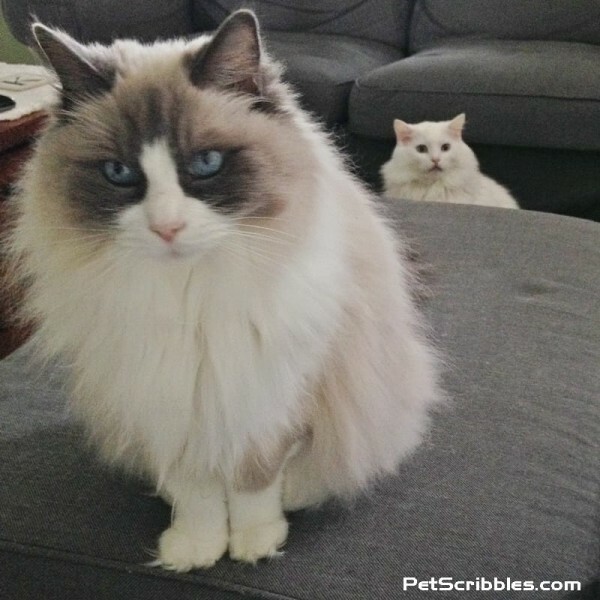 Otto being allowed (by Lulu) to peacefully coexist in the same room is a huge step forward! See how Otto is belly up in that picture above? 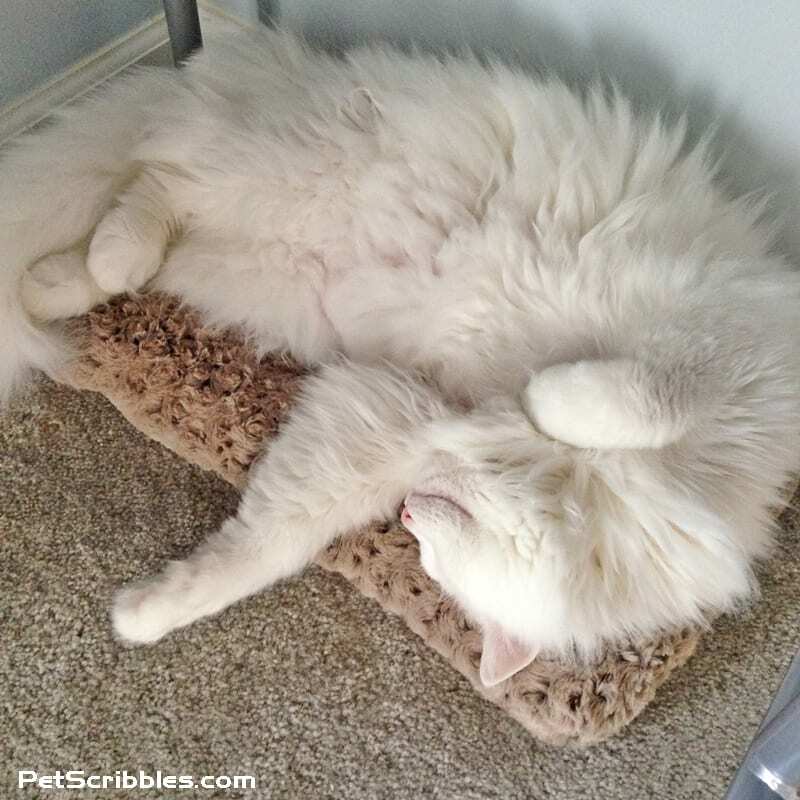 It’s how he always relaxes and sleeps. And whenever Lulu gets snippy with him, he just assumes that position and gazes at her. He’s determined! He loves her so much! 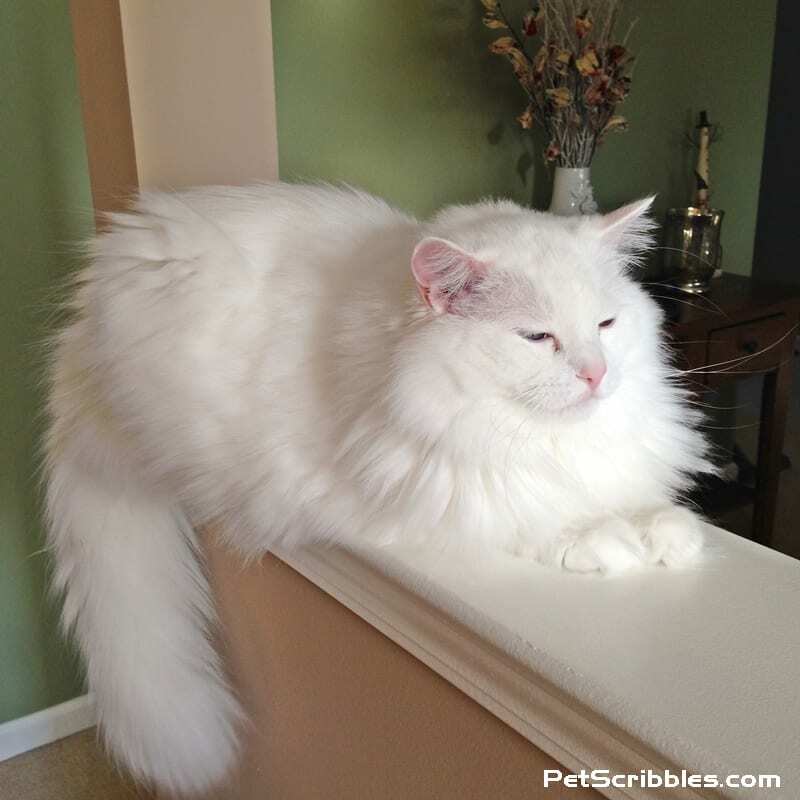 Most mornings Otto will spend some time on the ledge near the front door just relaxing . . .
And while Lulu is “working” with my husband all day long in his office . . .
. . . Otto is upstairs with me in my office playing with toys . . .
. . . relaxing under my desk . . .
. . . and snoozing the day away! Most importantly, the look Otto gives me now is a look of love and devotion. Gone is the worry and confusion and fear. Otto has become my sidekick, my shadow. 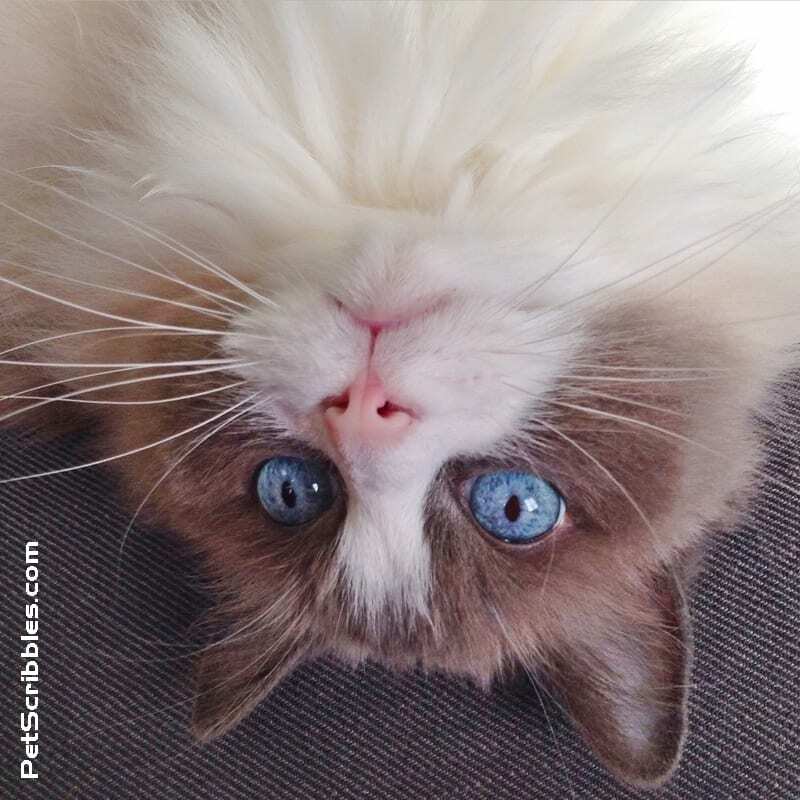 And Otto’s eyes – just like Lulu’s eyes – make me melt every single time! Yay! I am so happy for you all. Thanks for sharing the story. Inlove seeing your posts here and on Instagram. We are just undergoing this very transition. I hope they end up getting along! The new kitty is more dominant so it’s been interesting. We shall see.